Are Your Tax Records A Mess? Annual Tax Mess Organizer For Nail Techs, Manicurists & Salon Owners is a book designed for self-employed individuals who have difficulty keeping track of their expenses during the business year. Written by a retired tax consultant, Annual Tax Mess Organizer For Nail Techs, Manicurists & Salon Owners bills itself as “help for self-employed individuals who did not keep itemized income and expense records during the business year.” The book offers advice on reporting income, tips, and expenses, tracking inventory and mileage, growing your business with pre-tax dollars, preparing your own tax return, and dealing with special tax situations like booth renting and self-employment taxes. “All you need to make the organizer work is the organizational forms included in the book, 25 large envelopes, an adding machine, and an empty table or desk top,” says author Kiki Canniff. 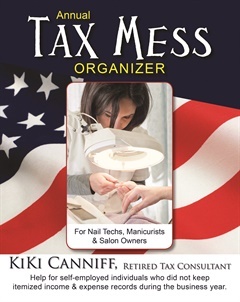 Annual Tax Mess Organizer For Nail Techs, Manicurists & Salon Owners is available on Amazon.com. Founder of Columbia Cosmetics, a private label cosmetics line.